Sinclair Broadcast Group's corporate mandates are exacerbating tensions between the company's local stations and its management. Journalists in local US markets are chafing at the company's requirements, including a new promotional campaign that echoes President Donald Trump's anti-media rhetoric. The promos, first reported by CNNMoney last month, went viral over the weekend after Deadspin edited dozens of them together to show how anchors across the country were told to read the same script. "It sickens me the way this company is encroaching upon trusted news brands in rural markets," an investigative reporter at Sinclair told CNNMoney on condition of anonymity. The reporter and other Sinclair employees in several different markets described tense conversations in their newsrooms and anger directed at the company's Hunt Valley, Maryland, headquarters. Sinclair (SBGI) is the biggest owner of local television stations in the United States, owning or operating 173 of them. A person in Sinclair management confirmed that tensions are on the rise. The company's conservative-leaning politics have come down to Sinclair's stations through "must runs" — stories local producers are told to air during their newscasts. The "Terrorism Alert Desk" is a recurring segment. Pro-Trump commentaries by former Trump campaign adviser Boris Epshteyn are another "must-run" feature. The new promo campaign took it to another level, causing even more consternation in local newsrooms. Scott Livingston, the company's senior vice president of news, directed stations to have anchors read a script about "fake stories" and "personal bias" plaguing the media, according to a memo obtained by CNNMoney. The script — reminiscent of Fox News' old "fair and balanced" tagline — cast Sinclair's stations as the antidote. Sinclair's political bent has been a factor in its pending acquisition of Tribune Media, which is under review by federal regulators. The deal would add dozens more stations to its portfolio. The Sinclair employees who originally contacted CNNMoney about the promo shoot said they felt it advanced the company's agenda at the expense of their own credibility. The employees said they felt they needed to speak anonymously because they were worried they could lose their jobs if identified. 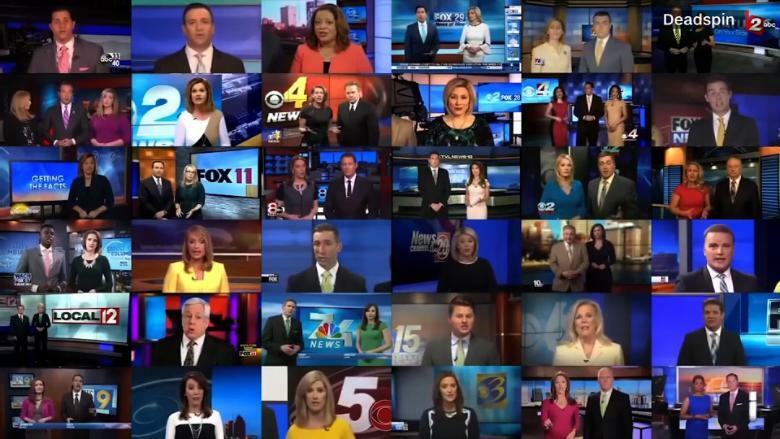 Deadspin edited dozens of the Sinclair local promos together to show how anchors across the country were told to read the same script. 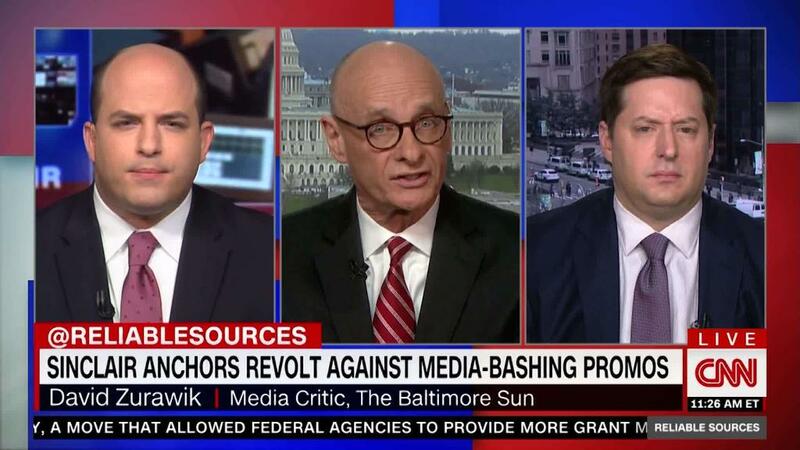 After CNN's initial story in early March, others expressed concern and frustration. "I try everyday to do fair, local stories, some Trump-related, but it's always washed out by this stuff they do at a national level," one local reporter said. Another employee came forward and told CNN that "as a producer who finds it unethical, I will refuse to run it." The promos started airing in late March. It is unclear if any stations have refused to broadcast them. An all-newsroom email from one station news director read: "Let me be absolutely clear here... These MUST Run. If they do not, my job is on the line. I don't say that to scare you by any means but I do say this so you understand how serious SBG is about this project." SBG is the corporate abbreviation for Sinclair. A Sinclair spokeswoman did not respond to requests for comment on Sunday. In his memo to stations, Livingston described a "Trust and Truth research" project the company did involving a well-known consulting firm called Magid. "Trust is the fundamental issue with connecting to news consumers. And we are a trusted news source," he wrote, describing the promos — "the local anchor message on Journalistic Responsibility" — as a followup. But some outsiders see it as irresponsible. In a sign of Sinclair's controversial stature, Deadspin's compilation of the promos — making the anchors in various markets sound like robots — went viral on Saturday. It has been picked up by political activists, journalists and comedians, among others. "This is extremely dangerous to our democracy," late night host Jimmy Kimmel tweeted Sunday. Media investor Peter Chernin, who held high-ranking positions at Rupert Murdoch's News Corporation for two decades, tweeted, "This is insidious. The first key to stopping it is to call on advertisers who support this propaganda and express your objections." Some of the concerned Sinclair staffers said they appreciated the national attention, but they're more worried about how local viewers are reacting. They pointed out that station Facebook pages and Twitter feeds are receiving criticism about the promos. "I feel bad because they're seeing these people they've trusted for decades tell them things they know are essentially propaganda," one local anchor said. The person, who has been in touch with counterparts in other markets, said anchors are especially bothered "because they have all this experience in news, and now they're being degraded like this."